The Washington Monument, a memorial to George Washington, our nation's first president, is the most prominent landmark in Washington, DC and stands as the centerpiece of the National Mall. The obelisk-shaped monument towers about the city, measuring 555 feet 5 1/8 inches high. Designed by Robert Mills, the structure was completed in two phases of construction, one private (1848-1854) and one public (1876-1884). The National Park Service was given jurisdiction over the Washington Monument in 1933. The height of the monument allows visitors to see the structure from various points around the city. These images show different views from across the nation's capital. Photo Details: The above image shows the Washington Monument looking east, across the Lincoln Memorial Reflecting Pool. While the U.S. Capitol Building can be seen in the distance, it is a mile and a half away from the monument. This is one of the best views of these important national landmarks. Fifty flags surround the base of the Washington Monument and symbolize the 50 states of America. The flags were first flown from wooden flagpoles in 1920 as part of the George Washington Birthday celebration. Aluminum flagpoles were installed in 1958 and they have been a permanent display ever since. Washington DC is especially beautiful during the spring cherry blossom season. Visitors flock to the Tidal Basin to enjoy the awesome views of Washington DC's iconic landmarks. The Washington Monument provides a striking image during this time of year. The Washington Monument is beautifully illuminated at night. It is a special treat to see the monument as it sparkles with reflections. This picture was taken from the George Washington Memorial Parkway and shows the reflection of lights from the Memorial Bridge on the Potomac River. The Washington Monument can also be seen from the North side of the National Mall. This is a view of the monument from Constitution Gardens, a landscaped area between 18th and 19th Sts. NW, Washington DC‎, between the Washington Monument and the Lincoln Memorial. 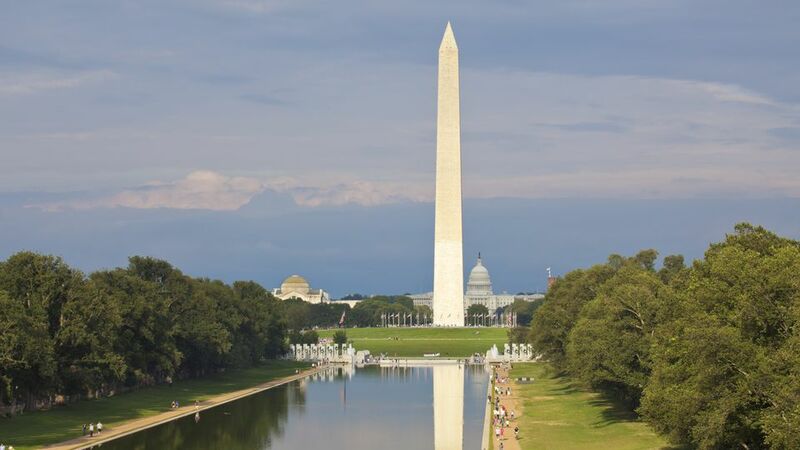 The Washington Monument is one of Washington DC's most treasured landmarks and can be seen from across the region. The monument is especially beautiful during the fall season when the trees surrounding it are colorful. This is a view looking at the National Mall from across the Tidal Basin. Visitors enjoy the view of the Washington Monument from across the National Mall. This is the view that you see as you approach the monument from the east side of the Mall (from the Smithsonian museums and Metro Station). Visitors can see the monument from many vantage points across the city and from Northern Virginia. For more information, see Washington Monument (Visiting Tips, Tickets & More).